– “The Customer” means the person, firm or company offering to buy goods from the Company. – “The Goods” means the goods or materials that the Customer is buying or offering to buy. The Customer should check product suitability before ordering. The Customer must not buy, sell or use products if they are in any way uncertain. . Do not alter or change the products or sell, pass on or use in any way that the manufacturer has not specifically agreed to. Do not infringe copyright. If you are in any way unsure of your legal position, seek independent legal advice. Every quotation is subject to change without notice. The Company reserves the right to withdraw after acceptance by the Customer where the Company is not satisfied to the Customers credit worthiness. All orders are accepted and quotations are given at prices offered when the order is accepted or the quotation given. The Company reserves the right to increase to the prices offered at the date of dispatch. The Company reserves the right to increase prices in the event of increases in any directly attributable cost. The Company reserves the right to amend prices to correct errors or emissions. Delivery is chargeable to all destinations the charges which will be shown on the shopping cart page. Delivery dates are promises given in good faith by The Company to indicate estimated delivery times but shall not amount to any contractual obligation to deliver at the time stated. The Company will accept no liability for or consequential loss or damage arising from delay in delivery. Goods are dispatched via various recognised carriers. It is the Customer’s responsibility to check all goods for damage before signing for acceptance of said goods.. Once goods are signed for The Company will not admit any liability for damage. 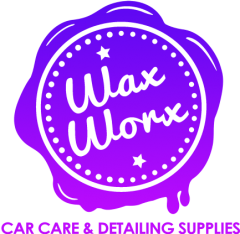 WaxWorx Car Care and Detailing Supplies will use its reasonable endeavors to deliver within 5 days of receipt of the Customer’s order subject to stock.Generally orders are dispatched same day if the order is placed before 2pm, subject to stock. If deliveries cannot be made and fail due to no contact with the delivery company and are then returned to our office before the goods are resent a charge of £25 will be made to cover the return postage and packaging. If the customer changes the delivery address once the consignment has been dispatched a further charge of £10 will be made to cover the change of address. If you have not received your order within 7 working days of receiving the despatch e-mail please contact us immediatley. The Company will repair or replace free of charge goods damaged in transit provided that The Company receive written notification of such damage within two days of delivery. Goods received in a damaged or unsatisfactory condition must be signed for as such. On receipt, goods should be checked with the advice note enclosed with the goods. Shortage claims will only be considered if The Company receives written notification of such shortage within 24 Hours of delivery, failing which no liability will be admitted. The packing and contents should be retained for inspection. The Customer has no right of cancellation of an order in whole or in part except with the Companies consent. The Company reserves the right to charge a restocking fee of 15% when cancellation of an order has been agreed. The goods shall remain the property of the Company until the Company has received Payment in full for the goods and the Customer will not pledge, charge or otherwise encumber the goods until the payment has been made in full. Goods to be returned must be notified to The Company within two days of receipt of goods by the customer, as goods correctly supplied may not be returned without The Company agreement. Goods so returned must be consigned (carriage paid) and accompanied by a packing note stating the Company invoice number and date thereof together with the reason for return. A restocking charge of 20% will be imposed. The Customer agrees that The Company may put its name and other details obtained from the order form into a computerised database for The Companies use and to enable The Company to provide the Service unless the Customer gives specific written instructions to the contrary. Customer information is not shared nor used for purposes other than order fulfillment and ongoing product development. Goods are warranted by the Company or authorised third party to the Customer against defects in workmanship and material during the applicable warranty period. Except for the express warranties stated above, the Company disclaims all other warranties or conditions whether express or implied in law.